It all began with a phone call one fine Sunday evening around three years back. PV Ramana Murthy, Executive Director – HR at Coca-Cola, India, received a call from Nick Wall, Group Director, Human Resources at the Bottling Investments Group (BIG) – Coca-Cola. “PV, the senior leadership team has taken a decision to initiate a leadership development programme for mid-level managers at BIG…would you like to be a part of it?” asked Nick. PV said yes… and that’s where our story begins! 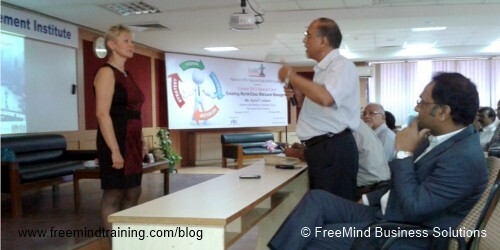 The story of LEAP – (Leadership Excellence and Accelerating Performance) Leadership Development Programme at Coca-Cola. 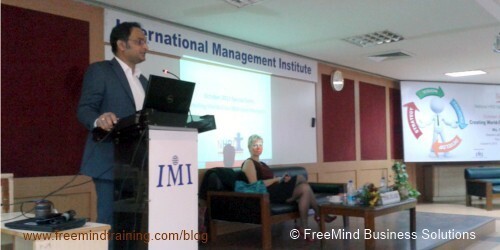 On the 9th of October 2013, at an NHRDN special event hosted at the International Management Institute, Delhi (IMI), I had the pleasure of listening to the story of how Coca Cola deployed a world class leadership development programme for mid-level managers. The LEAP programme was created by Ms. Sylva F. Juliano, a veteran in Leadership Development and (of course) the speaker for the day. Sylva is the Coca-Cola University Director of Learning and Development for BIG. She had previously spent 13 years with GE in various HR roles including leading mid-level manager development at their Crotonville Leadership Development Center. Sylva grew up in the Czech Republic and graduated from Charles University in Prague, one of the most beautiful cities in Europe! 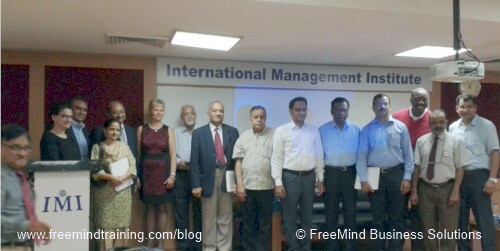 But First – Why a Leadership Programme for Mid-Level Managers? BIG is an 80,000 strong global organization with 2,500 mid-level managers – from sales, operations, HR finance and other functions. Prior to LEAP there had never been a serious leadership development intervention for Mid-level managers. Training programmes had earlier been conducted for the top or the lower third of the organizational pyramid. However, Mid-level managers form a crucial link. They are the ones who are responsible for translating an organization’s strategy into execution. Developing their capabilities further is therefore very important for the future success of the organization. So how did Human Resource gain the buy–in for such a programme from the business leaders? First of all, the top management approved it. This is where we should say ‘period’! However, Sylva herself spent a lot of time with business leaders across locations – speaking to them, understanding their needs and concerns which also contributed to the large support for the programme. What the programme was aimed at doing and how it would it would impact the business was discussed. The business leaders in each country took ownership for the LEAP programme. The content of the programme and the involvement of the business leaders as faculty also meant that this was not treated as an isolated learning event. More about this soon. I am sure you all agree with PV! After all, most of us would have experienced situations where a training programme disappointed us because of an inadequate need analysis. The need analysis at Coca- Cola, started with India, and then proceeded to China, the Philippines and then other countries. It included, among other things, personal interviews with the business leaders and focus group discussions with mid-level managers. Surprisingly the findings from the need analysis were consistent across nations – India, China, Singapore or Malaysia, despite the different cultures and different challenges. Of course, all training was linked to the leadership competency framework of the company, otherwise participants would not know how the learning fits into their roles. Though much of the learning was outsourced to external partners, Coca-Cola business leaders also took a highly active part in facilitating around half of the training sessions. GMs, Presidents, CFOs, HR leaders and other business leaders were coming in every single day. Not only were they contributing as subject matter experts, they were also being role models in driving the values that makes Coca-Cola a great organization. These were some of the questions that a senior leader would ask at the end of every day, after the sessions which were facilitated by external partners. The LEAP programme also involved the participants’ supervising managers in owning the learning process. This ensured that they would support the participants’ learning during the process of application. How? There was a learning contract between each participant and his/her manager which set the expectations. What will they learn in the workshop? What will they do after the workshop? The virtual kick-off included the managers where they were briefed on exactly what would happen and what support the participants would need from them after the programme. Everything in the learning agenda was always closely linked to the business. Rather than teach different skills and expect the managers to connect the dots, the programmes where structured around application of the learning. “What! 5 days! !”… I can hear you thinking right now! Yes, Sylva wanted people to be totally immersed in the learning process. Given the fact that there was a significant amount of content to be covered, 5 days was also quite necessary. There were three 5-day workshops, separated by 6 months of application. Each workshop was preceded by a virtual kick-off and pre-work, including psychometric assessments, which maximised the time utilization within the 5 day workshop period. This took place around 3 weeks before the workshops commenced. People had 12 hours of ‘homework’ to complete before the workshops! Coca-Cola actively supports a coaching culture. The LEAP programme also included participants being coached by senior leaders. This also helped the senior leaders to understand better what challenges the mid-level managers were facing. Coaches were carefully selected for the first pilot programme. In the learning interventions that I drive myself, I spend a lot of time on devising mechanisms for implementation of the learning back at work – therefore this was the part that personally interested me the most! In the LEAP programme, participants had very specific tasks that they have to complete when they got back to work. For example they had to share with their teams what they would delegate. Many of them were ‘doers’ who were operating at a level below. This was supported by their subordinates… who let them know when they were not delegating! ‘Teachbacks’ was another measure where workshop participants had to teach very specific content to their subordinates in turn. In addition to strengthening their own concepts this also made them better mentors and coaches. And they would of course have development conversations with their supervising managers. The impact of the LEAP programme was measured upto Kirpatrick Level 4. So how do you make it easy to deploy a global leadership development programme across numerous locations? Enter the LEAP Operating Manual. This is the Playbook or the Bible which helped deploy the programme seamlessly at each location. It contains “anything and everything that you need to know about the programme”! It had a checklist of everything from what the faculty needs to know to how to set up a training room. What makes LEAP a ‘World-Class’ Programme? Application focus – what will participant do differently back at work? This was undoubtedly one of the most informative NHRDN events that I have attended and I am sure others in the audience second my opinion! A big thank you to Sylva, PV, Ester, Bhagat, Manveet and everyone at NHRDN who made this event possible. Are you deploying a Leadership Development programme in your organization? Are you planning to do so?